As you might still remember, I was very excited by the release of the YSL gloss volupté (if not, you can read it again over here). The lips-shaped applicator was so cute that I exclaimed that I just have to buy it. Finally (after staying away from eBay and Gmarket >_<), I was able to buy my first YSL lip product. In the end, I didn't buy the three colors that I liked in the post or any of the three special top coats. Keep reading if you want to know which color captivated me in the store. I bought the YSL gloss volupté in the color 15 - grenade pépite from the Golden range. It has a very pretty grapefruit pink color (although the name seem to suggest pomegranate?) and small shimmers in various colors, but mostly in gold. Together with the Dior Addict Gloss 433 -Délice, these are the most expensive lip glosses that I own. But when I look at the beautiful color and the amazing shimmers, I just think it is really worth its money. It also has a very luxurious looking packaging with the famous YSL logo. 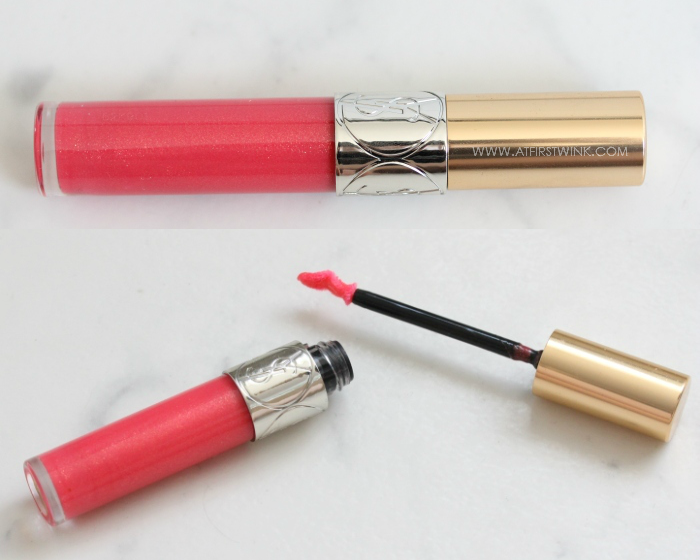 But the main reason why I wanted to buy the YSL gloss volupté is the cute lips-shaped applicator. Based on the promotional pictures, I thought that the applicator was flat, but I was very surprised to see that it had a curve in it. Although the shape is very unusual, I found it very easy to use. The curve creates a gap with which, you can scoop the product up and apply it on your bottom lip. The flat side (that looks a bit like the tool to even cement with) can be used on the upper lip. Now, let's finally see how the YSL gloss volupté looks like on my lips. To be honest, I didn't try the color out in the store. I basically just fell for the color and bought it. ^_^ So I was very surprised to see how visible the color is on my lips. 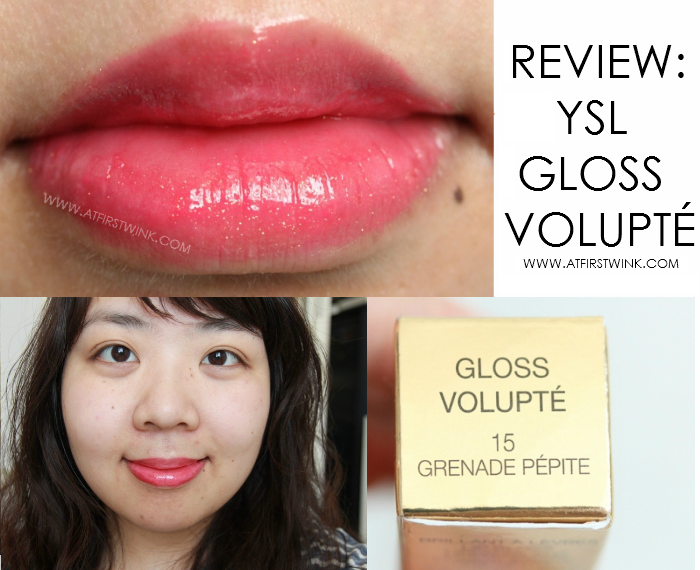 The YSL gloss volupté has a very soft and light texture as promised. It makes me barely even remember that I actually have lip gloss on my lips. This lip gloss also has a very pleasant watermelon scent that isn't very overpowering and the taste is very subtle and sweet. So you don't have to worry, when you accidentally eat some of it. Also, the gold glitters may look very abundant and visible in the close up pictures, but it looks very subtle from afar, as you can see in my full face picture. I don't know if it is just me, but I also seem to feel a slight tingling feeling, when I have just applied it on my lips, so it might have a little bit of a plumbing effect too. As a last word of recommendation, I advise you to see the colors in person as I have looked up this color on the YSL Beauty website and somehow, it shows a purple lip gloss color that doesn't even look like the color that I have.